Quirk Books, Philadelphia, 2009. 319 pages. This book is awful. Truly terrible. But I have to admit that I find it frightfully hilarious. This book should not go on lists titled “If you like Jane Austen…” It would be better for lists for those who don’t like Jane Austen. I found myself laughing out loud and reading bits to my 15-year-old son, who is not interested in the original book, but found this all perfectly reasonable zombie mayhem. In many places the story is much cruder, and definitely far more violent. I think they went too far when they had Elizabeth eat the beating heart of a ninja she’d conquered. I couldn’t stomach more than a few chapters a night. But I’m afraid I found I couldn’t stop. Knowing Pride and Prejudice as well as I do, I knew exactly what they had changed, and it was hilarious. For example, at the party where we first meet Mr. Bingley and Mr. Darcy, just as in the original book, Elizabeth overhears Darcy calling her “tolerable” and saying “I am in no humour at present to give consequence to young ladies who are slighted by other men.” But in this book, Elizabeth is insulted, and her warrior code demands that she avenge her honour. However, just as she is reaching for the dagger concealed at her ankle, a herd of “unmentionables” breaks the windows of the room and attacks the party. “Elizabeth immediately joined her four sisters, Jane, Mary, Catherine, and Lydia in the center of the dance floor. Each girl produced a dagger from her ankle and stood at the tip of an imaginary five-pointed star. From the center of the room, they began stepping outward in unison — each thrusting a razor-sharp dagger with one hand, the other hand modestly tucked into the small of her back. “From a corner of the room, Mr. Darcy watched Elizabeth and her sisters work their way outward, beheading zombie after zombie as they went. He knew of only one other woman in all of Great Britain who wielded a dagger with such skill, such grace, and deadly accuracy. “By the time the girls reached the walls of the assembly hall, the last of the unmentionables lay still. Later on, instead of being shocked that Elizabeth and her sisters did not have a governess, Lady Catherine is shocked that they didn’t have their own ninjas. Of course, probably the best part is when Elizabeth refuses Mr. Darcy’s proposal and kicks him across the room with a force that shatters the mantelpiece. You don’t mess with Elizabeth Bennett! Surely such a fate would make it worthwhile to marry even Mr. Collins. I also find Wickham’s eventual fate much more appropriate than the original. My only fear is that memories of this book might intrude the next time I reread that great classic, Pride and Prejudice. Today I attended the National Book Festival in Washington, DC, and had an awesome time! I learned a bit from last year’s trip, which was something of a fiasco. I didn’t waste a lot of time standing in long lines for autographs, but focused on the one author whom I really really wanted to talk to and get books signed by — Shannon Hale. And then I spent most of my time enjoying the author presentations — which turned out to be FABULOUS! Next year, I’ll add a step of ordering any books I want signed ahead of time. Both years, on impulse I’ve bought lots of books at the Festival, have waited in a huge crowd to purchase them, and then end up not waiting in enough lines to get them signed. I did buy books by a couple authors I didn’t even see, but at least they are good books I’d been meaning to read anyway. I saw three different fellow employees from Fairfax County Public Library who were also lucky enough to have the day off. In fact, I cheated a little bit and stepped into the book sales line to join Gena, the Woodrow Wilson Library Children’s Assistant. (She was almost at the back of the line anyway.) We talked and talked the whole time we were waiting to pay for our books, which made that a fun part of the Festival, too. 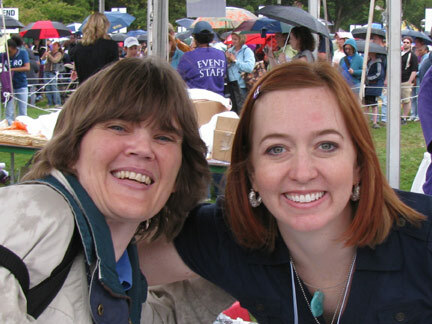 Shannon Hale is one of my favorite living authors, along with Robin McKinley, whom she acknowledges as her inspiration. Back in 2004, I named The Goose Girl the best book I read in 2003, the #1 Sonderbooks Stand-out 2003. I e-mailed Shannon about it, and she answered, and we corresponded for awhile. When I told Shannon who I was when I was getting my books signed, she gave me a hug! And asked how I am doing and if I’d finished my MLS. Such a nice person besides being such a wonderful writer! 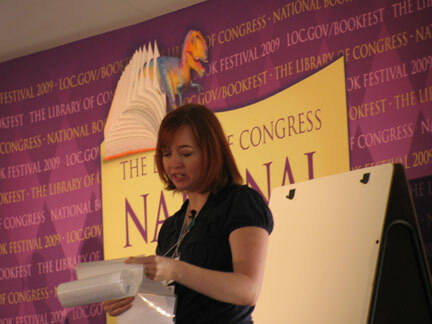 Besides that, her fabulous and funny talk was about her path to becoming a published author. She brought in a laminated roll of past rejection slips, which she has also posted on her blog recently. Somehow to know that such an exceptional writer was rejected for reasons that seem ridiculous to me — well, it gives me hope for my own writing. She talked about a principle she learned in a pottery class about throwing away your first 100 tries. I’m so very glad she persisted, found an editor who loved her work, and now has so many avid fans. I do love telling library patrons about her books, and I know of many, many other people who love her writing. So — the Shannon Hale part of my day was a tremendous success! Inspiring and thrilling! I felt so honored that she remembered me! Some day, some day, some day, I hope to be at an event as a fellow author — but that won’t happen unless I am as persistent as she was — both in submitting and especially in working on my craft. Here’s what she wrote in my book! After that, I spent the afternoon in the Children’s tent. I had hoped to get Mo Willems’ autograph, but his line was just way too long (at least if I wanted to make it to Shannon’s talk). And I did forgo trying to get Kate DiCamillo’s autograph in order to get to Mo Willems’ talk. 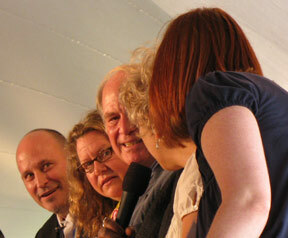 Then, since I was a fan of all the authors left on the program, I just stayed in that tent the rest of the afternoon. They were incredible! Tremendously entertaining and interesting and inspiring, every single one. I should mention that in the morning, I got in on the first segment of The Exquisite Corpse Adventure, which should now be posted on read.gov. 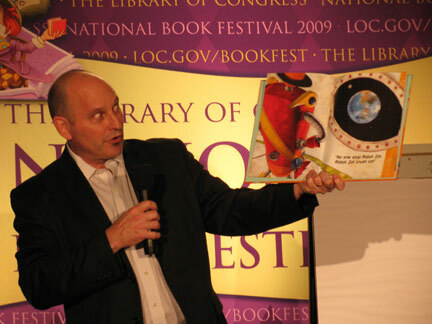 This is a tale put together by several different authors — and Jon Scieszka started it off with all kinds of challenges of things that would be in it — like a rollerskating baby, real ninjas and fake vampires, a talking pig, and of course a ticking clock. Watching the authors present teasers was great fun. First were Tony DiTerlizzi and Holly Black, talking about the upcoming last volume of The Spiderwick Chronicles. I didn’t have great seats for their talk or Mo’s, but at least I had a seat. They talked about how they got ideas — cool stuff about bestiaries and folklore. Tony did some drawings, which unfortunately I couldn’t see. 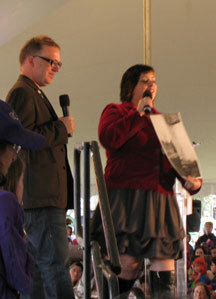 Tony DiTerlizzi and Holly Black telling about folklore and a house said to be visited by fairies. 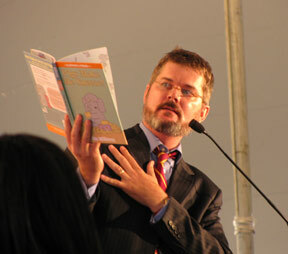 Then was Mo Willems, whom I consider an absolute genius. He did nothing to alter that impression. He read Naked Mole Rat Gets Dressed, Today I Will Fly (with other helpers), and his new Elephant and Piggie book, Pigs Make Me Sneeze. I also bought the new book, and when I read it to my teenage son, he pointed out that it teaches that correlation does not imply causation. So right! Almost makes me wish I still taught Statistics so that I could bring that book in to read to the class. Incidentally, my son wishes that Mo would write a book about Doctor Cat, a new character introduced in Pigs Make Me Sneeze. When it was time for questions, I loved how Mo answered the one about where he gets his inspiration: He’s lucky enough to get it in the mail every month. In the form of a mortgage bill! He said that writers get inspired when they need to get inspired. That’s their job. Another child asked why the pigeon appears in all his books. He said the pigeon is stinker and gets jealous when Mo writes a book that isn’t about him. So when he writes another book, the pigeon sneaks into the drawings when Mo is sleeping. After Mo spoke, lots of better seats became available! So I settled in for the rest of the programs. Steven Kellogg was the illustrator of one of my oldest son’s favorite picture books, The Day Jimmy’s Boa Ate the Wash. His smile was so genuine and warm, and he was a dynamo in his talk, illustrating the stories he told while telling them with enthusiasm and expression. It was delightful to watch. 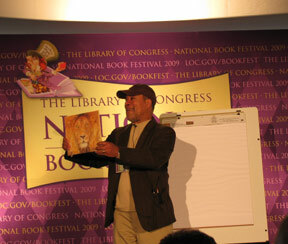 Then came Jerry Pinkney, talking about his new book, The Lion and the Mouse. I recently “read” this book at a storytime. It is a wordless book with sound effects, but even without me reading a story, the children were mesmerized by the glorious pictures, and it was fun getting them to tell me what was going on. 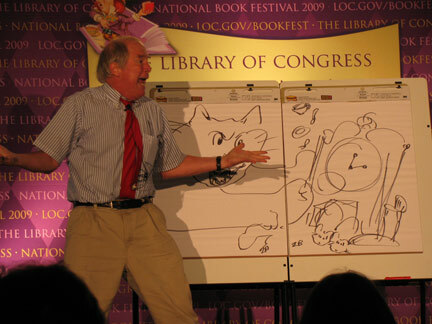 In his talk, Jerry told about the things in his life and in his childhood that inspired him to become an artist and gave him a love for animals. This talk was maybe not as entertaining, but it was enthralling and inspiring. 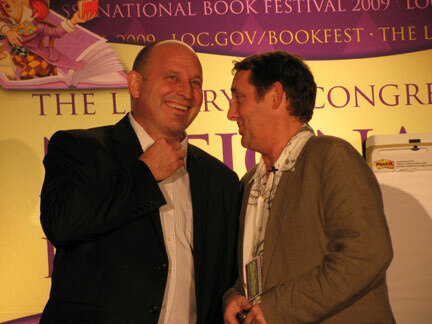 Finally, the last show was the two-man comedy act of Jon Scieszka and David Shannon, who have written a book together called Robot Zot. I definitely need to get my hands on a copy of that book! I can’t adequately express what it’s like to listen to those two men interact with an audience together. Did I say men? Perhaps they’d be better described as mature little boys. Not in a bad way, at all. Hmm. Recently I’ve been listening to a CD about accessing your inner archetype of the Playful Child. Let’s just say that these two have got that down pat. Two Playful Children entertaining a roomful of people. They talked about the collaboration process (and how the illustrator doesn’t listen to the author!) 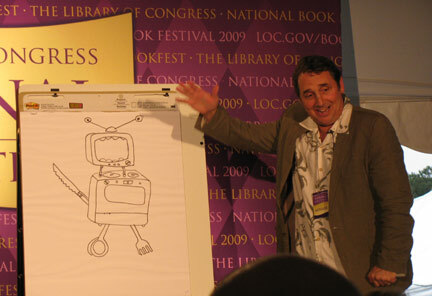 and read their new book, and then David Shannon drew a robot villain inspired by audience suggestions. But along the way, lots and lots of fun was had by all. Truly a thoroughly wonderful day! Books on Tape, 2007. Unabridged. 10 hours, 24 minutes. 9 CDs. 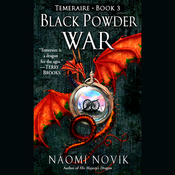 This is now the third book about Temeraire, the Celestial dragon serving in Britain’s Aerial Corps in this alternate history tale of the Napoleonic Wars. Temeraire and his captain, Will Laurence, are ready at last to go back to England after a successful mission to China in the second book. Before they set out, they receive orders to go by way of Istanbul to pick up three dragon eggs for England. To get there as quickly as possible, they must go by the overland route. Their voyage is difficult and dangerous and fraught with setbacks. Before they can get home, they wind up in the middle of Napoleon’s campaign to take over Europe and they in particular have gained a powerful enemy. You definitely should read the earlier two books before you read this one, and I predict that you will be hooked, as I am. Temeraire is traveling the whole world in this series, since he took a different route back from China than the one he traveled to China in Throne of Jade. So now we see him outside the naval setting, navigating all kinds of challenges, and now zealous for a new cause: the promotion of dragons’ rights, from seeing how well they were treated in China. I’m also hooked on Simon Vance’s vocal interpretation of the story, with Will Laurence’s proper British voice and Temeraire’s curious tone. I especially enjoyed the voice he gave the new hatchling in this book. I’m not even tempted to read the next book in print form — It is making my commute too much fun by listening. I’m also glad that I caught the series late — now I don’t have to wait before I can go on to Books 4 and 5. Philomel Books, 2006. 216 pages. I’ve long heard about the Enola Holmes Mysteries. I’m so glad I finally got around to reading one! This is the first story of Sherlock Holmes’ little sister, Enola. She’s something of an embarrassment to the family. She’s much younger than Sherlock and Mycroft and doesn’t act like a proper young lady at all. When Enola’s mother disappears on her fourteenth birthday, Sherlock and Mycroft arrive to take the estate in hand, and of course get Enola settled in a nice boarding school to become a proper young lady. Enola has other ideas. Enola is resourceful, and her mother has even left clues to help her. Setting out on her own, in disguise, can Enola elude her brother, the world’s greatest detective? Along the way, Enola encounters a case of her own to solve, and she has insights that even great detectives don’t have access to. I’ll definitely be reading more Enola Holmes stories. She’s feisty, smart, and resourceful. Her perspective on the mysteries around her is refreshingly clear-sighted. And she can outwit Sherlock Holmes! I’m going to KidLitCon 2009! Ever since I participated in Mother Reader’s 48-Hour Reading Challenge, I’ve been meaning to do more blogging on this blog, and not only post reviews. However, I’ve got this consistent stack of 20-21 books that I’ve read that are just waiting to be reviewed. I’m shooting for a review a day, and my theory is that if I hit that goal eventually I will catch up. But then I get slowed down by one thing or another. Getting sick with a cold or headache is worst, since I tend to step up my reading at the same time that I am writing less reviews. Anyway, today I got an e-mail from Mother Reader, who is organizing the Kidlitosphere Conference (for Kidlit bloggers), and she says I can post the KidLitCon badge you can see at the top of this post. So of course if I post the badge, it’s best to explain it, right? Okay, I guess I’m prattling on. I tend to do most of my blogging about life on my other blog, www.sonderbooks.com/sonderjourneys including things about my spiritual journey. But when it comes to blogging about life as a reader and a librarian and a writer and a blogger, this seems like a good place. I’m excited about going to KidLitCon 09. It’s October 17, and it’s in Washington DC, so I can do it cheaply and won’t even need a hotel or plane fare. I’m only just becoming aware of the community of Kidlit bloggers. I feel like a little kid on the playground and I want to play, too! I began Sonderbooks back in 2000, before I had even heard of blogs. I started it as an e-mail newsletter about all the good books I’d read lately, and eventually decided to turn it into a website. For a long time, I kept it as “issues,” where I posted reviews of about ten books at a time, and e-mailed my subscriber list with all the reviews. It took me some time to figure out this really fit the blog format, so after I got my library degree and moved back to America, I switched it to a blog, though I still like the way the website organizes the reviews, so I’m keeping that as well. Anyway, I never really read other book blogs, because I have plenty of books to keep up with just with what passes by at the library. However, I’m finding it’s fun to read what other people think, too… So now I’ll get to meet some of those people, and I think it’s going to be fun! Do you think they’ll let me into the club? What’s more, this week is the National Book Festival in Washington DC. I went last year and it was something of a fiasco for me. We got rained on. I spent lots of money and waited in long lines buying people’s books, but then my son wasn’t happy to wait in more long lines to get them signed. And they were out of the books I most wanted. 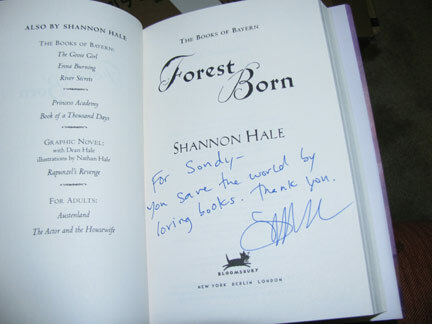 This year, I’m going to try for one author signing: Shannon Hale. I will bring my own copy of Forest Born, though I’ll also try to snag a couple copies for gifts. Other than that, I will focus on hearing the authors speak, particularly Jon Scieszka (who was a riot last year) and Mo Willems and Kate DiCamillo and Sharon Creech and Judy Blume and David Shannon and… Get the idea? Okay, I probably won’t be able to resist buying a few more books while I’m there and trying for a few more signings. But we’ll see. I am going to try to make hearing authors speak my priority. I also plan to arrive early and drive myself and hope that gets me a parking spot. And keeps me from starting the day carsick from the Metro. And I’m excited about it all! Books and Blogging and Writing and Good Stuff! Since my husband left me, in so many ways I’m forced to redefine myself and figure out who I am and what I’m all about. I became a librarian and I’m a writer and a book lover and a book reviewer and blogger. And all those things tie together, and they are represented by these conferences. Woo-hoo! I’m excited! Mind you, the Math part of me is alive and well. I’m sure of that because I find myself just delighted when my son asks me questions about his Trig homework. I find myself wishing it were ethical to do it for him, just because it would be so much fun. Needless to say, he finds that highly annoying. Maybe I’ll find someone who’s written a book about Math. Scholastic Press, New York, 2009. 391 pages. Wow. The Hunger Games was gripping, heart-wrenching drama, but in this sequel Suzanne Collins has turned things up a notch. Katniss’ troubles and her family’s troubles should have been over at the end of The Hunger Games, but she challenged the power of the Capitol, and those in power were not pleased with her. What’s more, Katniss has become a symbol of rebellion. Could that rebellion be spreading? One thing is sure — if it is, it will be brutally squelched. And if Katniss can’t convincingly quiet the uproar she started, she knows her own loved ones will suffer. This is definitely not light, cheery reading. As if all this weren’t enough, we’re stuck reading about the next year’s Hunger Games, this time a Quarter Quell, for the 75th year of the games, with its own fresh horror. The story is not complete with this volume. I will definitely be one of the people clamoring for the third book. I do join with my friend Farida to say that it had just better offer some happiness and hope for these people! Even though the topic is unpleasant — a future repressive and brutal government — the story is transcendent and definitely worth reading. The story has a love triangle, life-and-death drama, and people risking their lives for freedom and justice. The book will keep you reading and then stick with you when you have to put it down. The only awful thing about this book is how long we’re going to have to wait before we can find out what happens next. Bloomsbury, New York, 2009. 389 pages. It’s always a momentous event when a new Shannon Hale book comes out, and Forest Born adds another story to the Books of Bayern series. I eagerly pre-ordered this and when it arrived on its publication date, I snapped it up and didn’t stop until I’d finished. I will have to read it again in a week or two to savor its goodness more thoroughly! I like the way Forest Born explores themes that came up back in the first book, The Goose Girl. Naturally, if you have read the other three Books of Bayern, you won’t need my urging to read this one. If you haven’t, I recommend that you start with The Goose Girl, a retelling of the Brothers Grimm fairy tale. “When the creator made the world, everything had its own language, and all could communicate freely — tree to wind, rock to snail, flower to honeybee. Last of all, the creator made people, and they strode over the land, speaking strong words and taking control. They broke the balance, and one by one knowledge of the languages was lost, leaving creatures deaf to any but their own. In Enna Burning, Isi’s friend Enna learns the language of fire, and uses it to deadly effect in the war with Tira. But both friends learn that they need balance — that knowing only one language will overwhelm them. In River Secrets, they are trying to establish peace with Tira after the war, and encounter and make friends with a water-speaker. Once again, there needs to be balance. Razo’s sister Rin calls those three women “the Fire Sisters.” They are truly powerful. Now it is Rin’s turn. She has been able to listen to trees and hear their calm peace all her life. But after she does something she’s ashamed of, all she can hear from the trees is loathing and fear. She goes to the palace to get away, finds work tending the little prince, and gets caught up in a plot against the royal family. Another fire speaker tries to harm the king, so it is natural for the Fire Sisters to set out to deal with them. Rin follows and ends up learning much about her own gifts. I like the way Rin’s abilities are essential to averting disaster, even with such powerful companions. 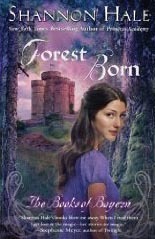 I like the way Forest Born brings the plot full circle, echoing issues that came up in the first book, The Goose Girl. I like the way the new abilities work, and especially the new aspects of some old abilities already seen. It all seems so right. I like the way Rin sees that Isi is truly a queen indeed. She felt so inadequate back in the first book, but we can see how she has grown to fill the role she was born to fill. Along the way, Rin makes plenty of discoveries about her own place in life, and along with an exciting plot, terrible danger, women with awesome powers, and the company of much-loved friends, Forest Born is truly a wonderful book. Candlewick Press, 2009. 36 pages. Last week I did a Drop-in Story Hour, where I read books to preschoolers for an hour. I used it as an opportunity to introduce the families to several of the picture books from our New Books shelf, without worrying about theme. By far the hit of the day was Toot Toot Zoom! by Phyllis Root. Pierre is a fox with a little red car who lives at the foot of a sky-high mountain. You have to turn the book on its side to see just how tall the mountain is. But poor Pierre lives all alone, so he decides to go to the other side of the mountain to look for a friend. The road up the mountain is a series of hairpin turns, so of course Pierre has to honk his horn at every curve. 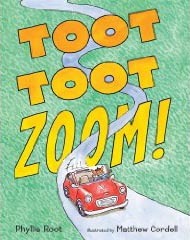 This is where the preschoolers quickly learn to chant along with you as you read: Toot! Toot! Zoom! But as they head down the other side, it turns out (no surprise) that the car has no brakes. The pictures of the disaster are most exciting, but all four animals reassure us that they are not hurt. At first, it seems a terrible outcome, but the four animals come up with an ingenious solution as they realize that all four have indeed found friends. Perhaps our enjoyment of the story was increased because that day only little boys came to storytime. (They did not respond with nearly as much interest to a book about a princess. Go figure.) But this book was definitely tremendous fun for all of us to enjoy together. Hay House, Carlsbad, California, 2008. 205 pages. Led By Faith continues the story Immaculee Ilibagiza began in Left To Tell, telling what happened after her amazing escape from the Rwandan Holocaust. That story is an astonishing one of survival and of how God spared her life, protected her, and helped her to forgive the evil men who killed her family and so many others. Led By Faith tells of Immaculee’s less glamorous struggles, trying to follow God’s leading in the aftermath of the horror. She deals with more prosaic concerns like sexual harrassment, fighting false accusations, breaking up with her boyfriend, paying for a wedding, and finding a job in America. In many ways, these struggles were much easier for me to relate to, but she still deals with them with amazing faith and forgiveness. The timing of my reading this was excellent, coming just when I needed it. Last night, I got a chance glimpse on Facebook of a young woman whom I knew had had a long-standing affair with a married man, and encouraged him to leave his wife and kids. Then shortly afterward I saw on a friend’s profile the profile picture of a man I’d been acquainted with — who was posing with a smiling young woman — presumably the woman he abandoned his wife and kids for. That got me reflecting on how much, how very much, pain and suffering is caused to people and to innocent children by adultery — and yet our culture treats it as if it’s all a lovely step of growth, something to be proud of. Such men proudly appear in public with their new “love,” pretending they haven’t made fools of themselves and deeply wounded the very people they promised to love and cherish. I have many friends now who have been betrayed by their husbands. Some are happily married now to someone else, some are happily married to their original husbands, some are living a happy single life, and some are still in the midst of the pain and suffering. But all suffered horribly, all have been through incredible and unbelievable pain. All would agree with me that there is a reason that God calls adultery evil, plain and simple. “I was no longer afraid of Mr. E, and I was no longer afraid of Kingston. I felt sorry for these men, who only looked for material gain or physical gratification, never caring whom they hurt to satisfy their wants. Looking at Mr. E, I now saw him for what he was: a weak and pleading man with a dirty mind standing by the edge of a hotel bed. All he saw when he looked at me was an orphan he could mistreat without fear of getting caught or facing the consequences. It was all too familiar, and God had helped me through far worse situations with men far more vicious and depraved than Mr. E.
“What good did he think his power would do him when he faced God? How could he think his money would protect him when all he had could be snatched away from him in an instant? Don’t Immaculee’s words apply equally well to any sinner? She is consistent in reminding the reader what a horrible place those who do evil have gotten themselves into. We can forgive them, because God is more than capable of taking care of their punishment, and their own consciences will punish them cruelly. If we refuse to forgive, then we only bring ourselves into that hell with them. Why should we give them so much power, when turning to God, Who gives the power to love and forgive, can bring such healing? I’ve noticed with my friends who have been betrayed that the betrayers consistently aren’t able to face the guilt and shame of what they’ve done — so they consistently blame their wives for their actions. They don’t want forgiveness, which would imply they had done something wrong. They want to be excused. They want to go along with our culture’s lines like “They were too different,” or, “She didn’t meet my needs.” In the case of the Rwandan genocide, the government was all too eager to portray the Tutsis as insects who needed to be exterminated. But, inevitably, the guilt came later. Immaculee’s perspective, to first feel sorry for the perpetrators, is so valid. That young woman can smile in the profile picture — but how in the world can she possibly have a healthy relationship with someone who is already established as a liar and a cheater? And why is it, with the broken marriages I know about, that the one who cheated is the one eaten up and consumed by hatred, bitterness and lack of forgiveness? Where is all that happiness they said they were going to find by leaving their wives? Okay, I’m going on and on about what was on my mind when I was reading the book, and not about the book itself. But it’s that kind of book — a beautiful model of love and forgiveness and guidance and walking by faith. It tells you that sinners are to be pitied, and evil can be overcome by good. The principles can apply to almost anyone. If you have ever been wronged, if you have ever noticed evil in the world around you, if you have ever worried about what to do next or how you would get by, then you can learn from and be inspired by Immaculee’s story. I wish her all the blessings in the world. And I love her message that love and forgiveness can overcome hatred and evil. “Cousin Ganza had told me that people were healing in Rwanda, that faith was being restored. God, he said, was working a miracle of forgiveness in our country. Gazing out over the glowing city below me, I knew that this miracle would inspire the entire world. If the evil that was unleashed here could be conquered with love, where could evil not be conquered? If the hearts of Rwanda could be healed through forgiveness, then what heart couldn’t? But now that Agnes is past twelve and was given a copy of The Saints’ Way by their blessed leader, Emmanuel, she would like to be a saint. Perhaps it will take fasting, or punishing herself if she does something wrong, but she wants to live a holy life. Honey, on the other hand, would rather push the boundaries. Her mother left her at Mount Blessing when she was a baby. When Honey’s caught kissing a boy, she’s labelled a harlot — in red marker, next to the welts on her back from her whipping. When Agnes’ grandmother Nana Pete finds out, she wants to rescue the girls and Agnes’ brother Benny from the commune for good. But there are some secrets in their pasts that need to be cleared up, and Nana Pete’s health is precarious, and Agnes does not want to leave her parents or her home. And she certainly doesn’t want to give up the call to the life of a saint. Certainly Emmanuel can’t do anything wrong, can he? This powerful and thought-provoking novel pulls you in and lets you see both girls’ perspective at once. Will they be able to break free? You are currently browsing the Sonderbooks blog archives for September, 2009.